More than two billion records and CDs could have gone missing from personal record collections in the UK, fuelling digital music sales, suggests research. The survey of 1,000 adults found theft or friends failing to return CDs contributed to depleted collections. Napster, which commissioned the report, said the figures suggested this was driving the move to digital music. The survey found 25% of people prefer to listen to music via their PC or MP3 player rather than a hi-fi. And 35% by of those questioned by ICM opted for storing their entire music collection in MP3 format rather than CD or cassette. The figures show the average person owns 126 albums but 37 have had to be replaced for various reasons. Among the main reasons for albums to go missing are an ex-partner gaining custody of them when a relationship ends or being stolen from a party. "This latest ICM research underlines the tremendous shift towards digital music that we've witnessed all year," said Leanne Sharman, Napster vice-president and UK general manager. "This is further borne out by these findings which show how quickly traditional record formats are becoming obsolete." But a survey in 2004 by Jupiter Research suggested CDs will stay the most popular music format until at least the end of the decade. 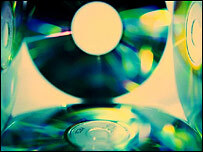 Is music safe on compact disc?